In 2016-17, there was a shortage of 19 lakh (1.9 million) blood units in India. In 2015-16, this number had dropped to 11 lakh (1.1 million). These numbers demonstrate the enormous requirement of blood units in hospitals. Every year, the nation requires about 5 crore (50 million) units of blood, which translates to a demand for blood every 2 seconds. Keeping these numbers in mind, the media and other reports suggest that there need to be more than 38,000 blood donation camps organized per day to meet the requirement. It brings to light the significance of blood and its donation. Recognizing its critical nature in time, Sadguru Shree Aniruddha incorporated blood donation as one of His key programmes. Sadguru Shree Aniruddha has written in Anandasadhana, the third volume of the Shrimad Purushartha Gratharaj that God is extremely pleased with nine different types of drops, one of which is a drop of blood donated unconditionally by one Shraddhavaan to the other. 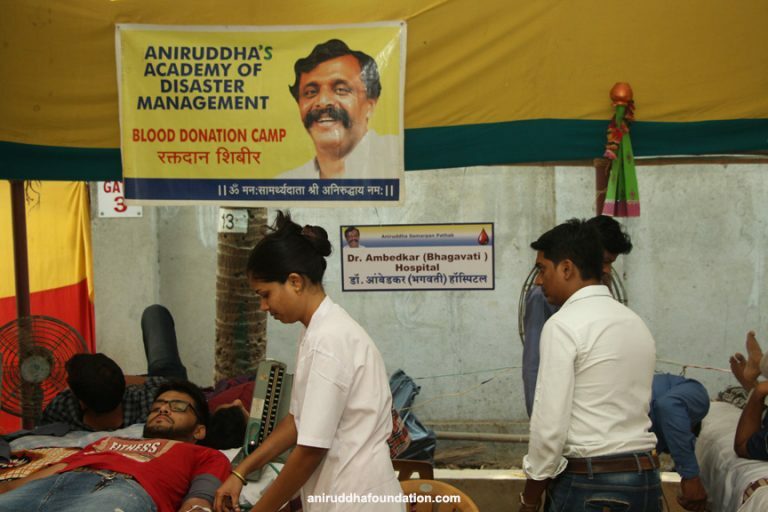 Since 1999, a mega blood donation camp has been organised every year in April, by the network affiliates of Sadguru Shri Aniruddha Upasana Trust, Aniruddha Samarpan Pathak, Aniruddha’s Academy of Disaster Management, Dilaasa Medical Trust and Rehabilitation Centre, Shri Aniruddha Upasana Foundation and Aniruddha’s House of Friends. The camp takes place at the New English School (Harigurugram) in Bandra. Why April? It is because the shortage of blood units is at its peak in this month, as most people visit their hometowns and villages during the summer vacations. The first camp was held at the Swatantryaveer Savarkar Smaarak, Dadar on 21st February 1999, where 154 blood packs were collected in a single day and donated to the Tata Blood Bank. 19 years have passed since, and the nature of this camp has transformed completely. Awareness had been raised about the camps via the local Upasana Centres, which increased its participation over time. Today, thousands of blood donors participate in these camps. They take place not only in Mumbai but the camps are simultaneously also held in various parts of Maharashtra. What started with 154 blood packs in 1999, has increased to 412, 613 and 1548 in the years 2000, 2001 & 2002 respectively. These numbers have only kept growing ever since. Other places in Maharashtra that held blood donation camps contributed to 2932 blood packs in 2018. Since 1999, more than 1 lakh (100,000) blood packs have been collected, which is a resounding achievement of Shri Aniruddha Upasana Trust. The ‘Maharashtra Government Blood Transfusion Council’ has appreciated the efforts of the organisation and has acknowledged the blood donation camp as a model on ‘how to organise a blood donation camp’. Moreover, various organisations invite the organisation to help conduct blood donation camps for them. This is the greatest achievement for the blood donation camp. In 2010, a political party in Maharashtra had invited the organisation to arrange a blood donation camp where a record-breaking 25,000 blood packs were collected. This feat has been registered in the Guinness Book of World Records. One of the reasons behind these numbers which began with a few hundreds is the awareness created about the blood donation, as many a time mere mention of blood donation induces fear. Nevertheless, the blood drawn during a donation is no more than 300 ml. After donation, the blood returns to its original levels within 36 hours, while the blood cells return to normal levels within 2-3 weeks. It doesn’t cause any trouble or injury to the body but in fact, our few millilitres helps to save a life. Our organisation and its Upasana Centres attained tremendous success in convincing these facts to the Shraddhavans. One month before the camp starts, all the Upasana Centres encourage the Shraddhavans to donate blood. The Shraddhavans also encourage their friends and relatives to become a donor. All questions, such as, who can donate blood? what precautions need to be taken while donating blood? what is the prescribed diet before donating blood? – are answered in detail before the camp. Moreover, the awareness is now also raised via our social media channels. Hospitals and blood banks participate in the blood donation camp. Their doctors and paramedical staff work in tandem with their counterparts associated with our organisation for the entire day with the same promptness. On the day of the camp, all the potential donors form an orderly queue before the camp opens. Many Shraddhavans come to the venue in buses arranged by their Upasana Centres. The camp is very well-organised. At first, the donor is asked at the counter if they have had any tea or breakfast. If not, it is made available to them after which they are asked to fill out the forms with their personal and medical details. The haemoglobin and other parameters of the donors are examined. Only if all the parameters are satisfactory, the person is allowed to donate blood. Besides, the crowd management is so flawless that it even prevents overcrowding. The entire camp is imbued with devotion and people donate their blood against the rhythm of gajars. The fear of donating blood is thus lowered and their enthusiasm to participate enhances. Those who cannot donate blood, perform the devotional service of working on the charkha (spinning wheel), and they also undertake an oath to donate blood in the following year certainly. On 22nd April 2018, Shri Aniruddha Upasana Foundation along with its affiliated organisations simultaneously conducted blood donation camps at 39 locations in Maharashtra. Overall 8770 blood packs were collected. This includes 5838 packs from Mumbai and 2932 from the rest of Maharashtra. Apart from Mumbai, the camps were conducted in other districts such as Pune, Kolhapur, Raigad, Ratnagiri, Akola, Jalgaon, Sindhudurg and Palghar. The camp was organized at 17 locations in Pune which yielded 1640 packs and in Kolhapur, it yielded 424 packs. In the Palghar district, 127 packs were collected in Boisar, 131 in Palghar and 83 in Dongaste. The numbers from other places were, Uran – 121, Akola – 16, Miraj – 82, Waghotan – 28, Sangamner – 72, Chopda – 11 and Dahanu Road – 89. In Bandra, 40 blood banks participated, which included the K.E.M. Hospital, Nair Hospital Blood Bank, Saifi Hospital, Kokilaben Dhirubhai Ambani Hospital, J.J. Mahanagar Raktapedhi, Babasaheb Ambedkar Municipal Hospital, Sion Hospital, Rajawadi Hospital, Ayush Blood Bank (Nagpur), Blood Line (Thane), Wadia Hospital, D.Y. Patil Hospital, Bombay Hospital, Masina Hospital, Tata Hospital and others. The blood donation camp is not just an annual event, as every Upasana Centre organises a camp every six months. These camps receive a good response as well. The importance of the blood donation camp is enormous, considering the shortage of blood units faced by the country. Hence, we must participate in these camps and donate blood.